…but let me start slowly from the very beginning. 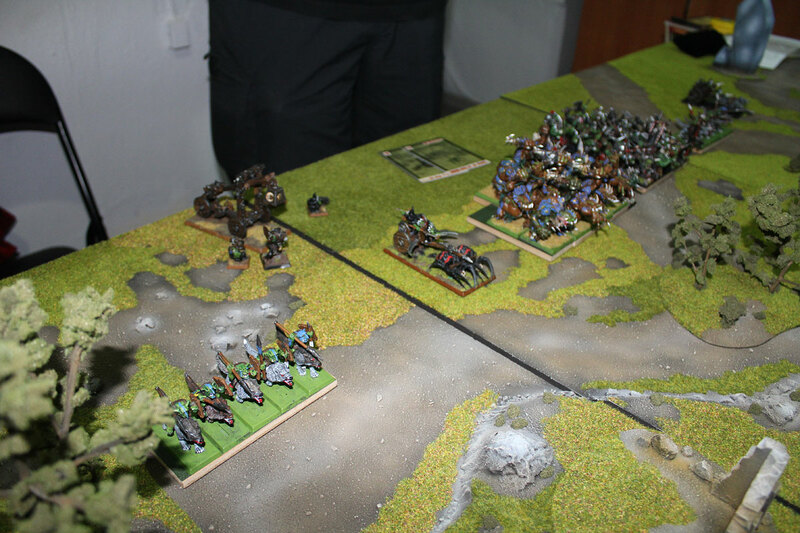 I’ve arranged the battle trough Polish Warhammer Fantasy Battle forum – Border Princes with Piotrek (he plays Orcs and Goblins). We supposed to play in the beginning of July, but due to some unexpected events we were forced to re-schedule the battle until last Thursday. The battle for 1500 points when I finally will be able to play me second freshly finished Doomwheel and try out how exactly Assassin is making out in battlefield conditions. 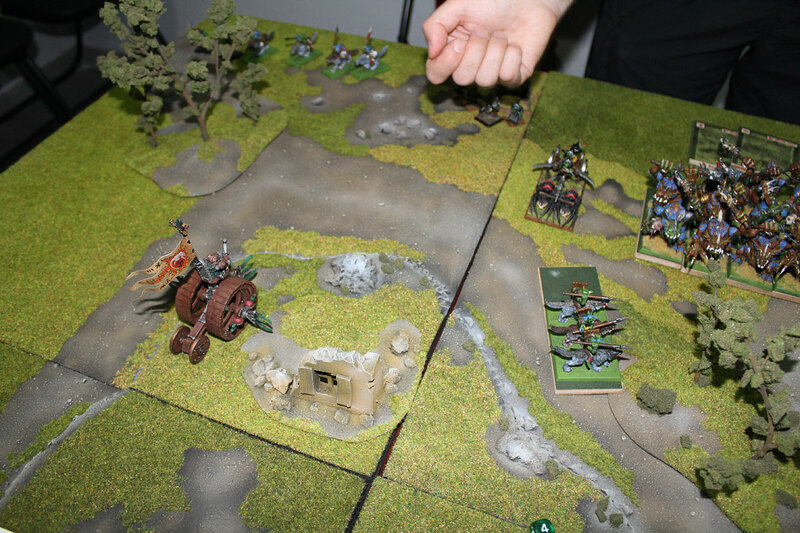 We played in Bunkier Store, here in Warsaw, where there is nice table available with plenty of terrain pieces. It was all on purpose. I fled the battle to spare all the fuss with transporting unreliable slaves to the mine. The Council would not be happy with that situation. This is actually way better. Good-good. The watchtower was in the middle of the battlefield. It was the old hideout of Orcs warband. Skaven happened to surprise the tower unprotected while Orcs were returning from one of the raids. Skaven army was south of the tower. Grey Seer Quiksqueek and Battle Standard Bearer have joined unit of Stormvermin (along with hidden Shide the Silent – freshly recruited Clan Eshin Assassin). Warlock Engineer has joined unit of Clanrats. Orcs started north of the tower. Orc deployment. 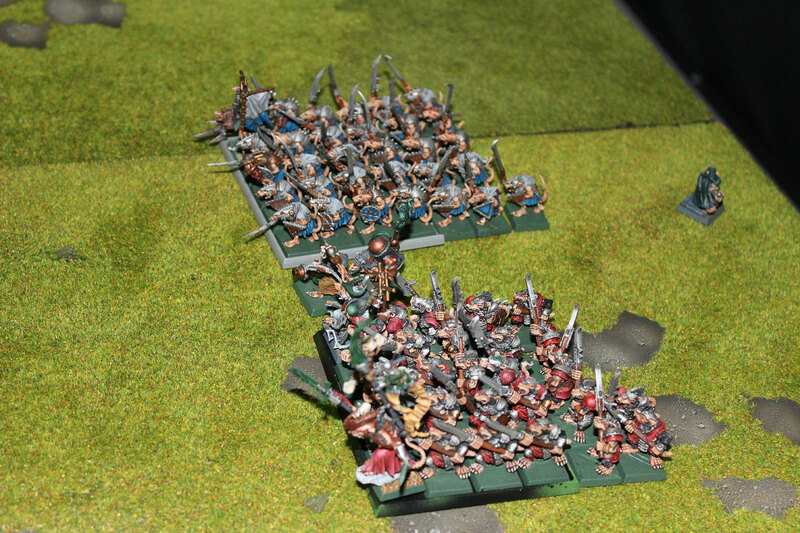 Left flank: Rock Lobberand Wolf Riders. In the middle: Spider Chariot, Trolls and Big Uns. 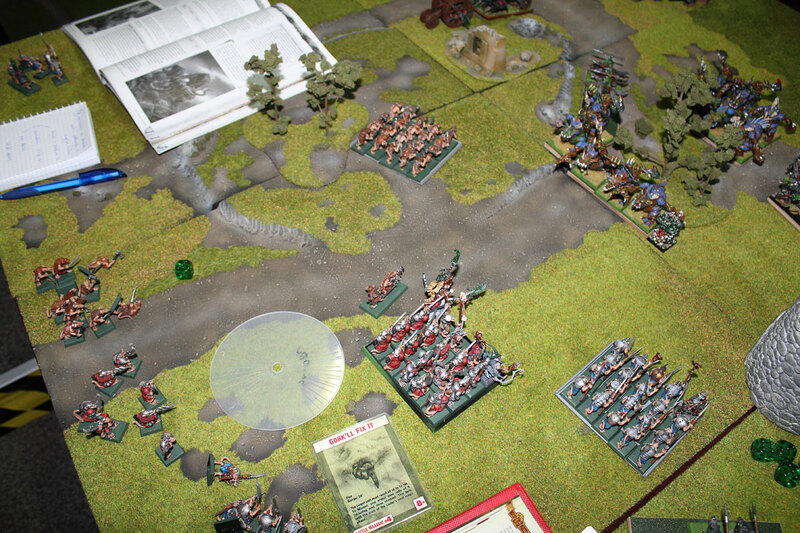 Right flank: Wolf Chariot and Wolf Riders. Orc Warboss Gurokk Skullstompa has joined Trolls. Bannawava Black Orc Big Boss and Goblin Shaman has joind Big Uns’. Meanwhile both Doomwheels rolled ahead. On the western flank – Old Mark 5. 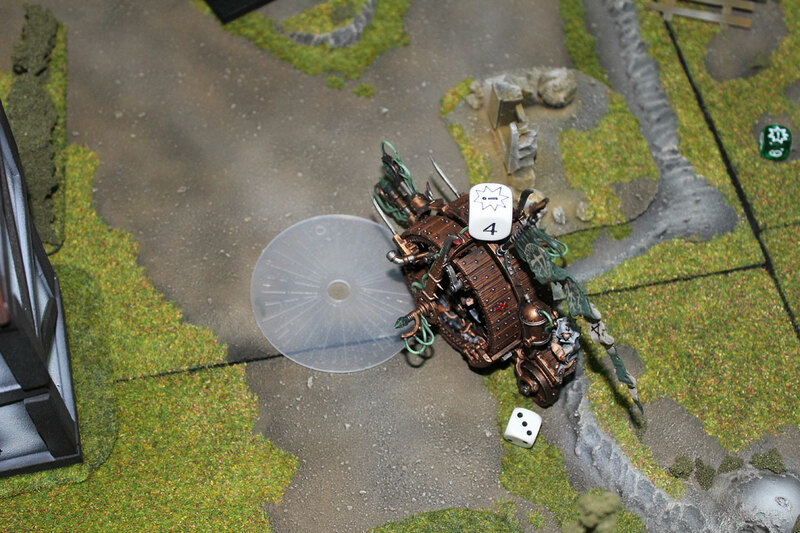 Doomwheel rolled at almost its highest possible speed (I rolled 16 for the move on 3D6!) and new Mk 7. Doomwheel on the east was just a little bit slower. 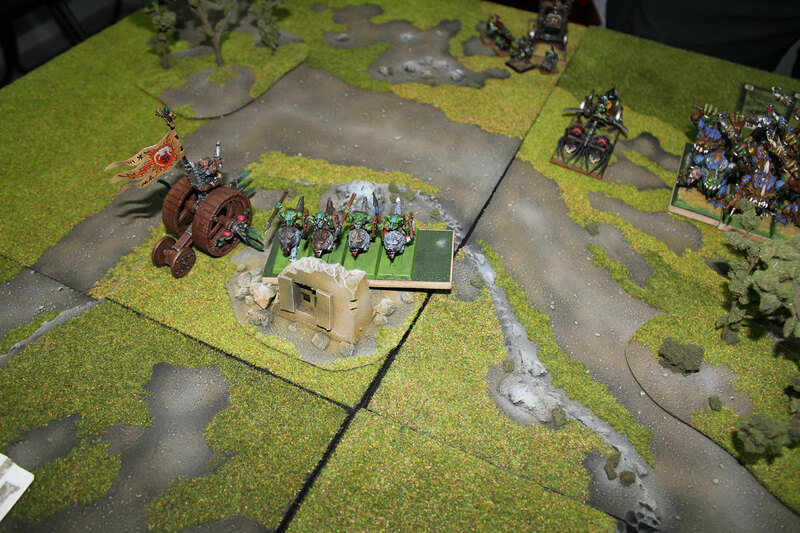 …but before all of these actions were even planned in Quiksqueek’s head – Gurokk Skullstompa ordered two small units of Wolf Riders to proceed with fast vanguard moves. 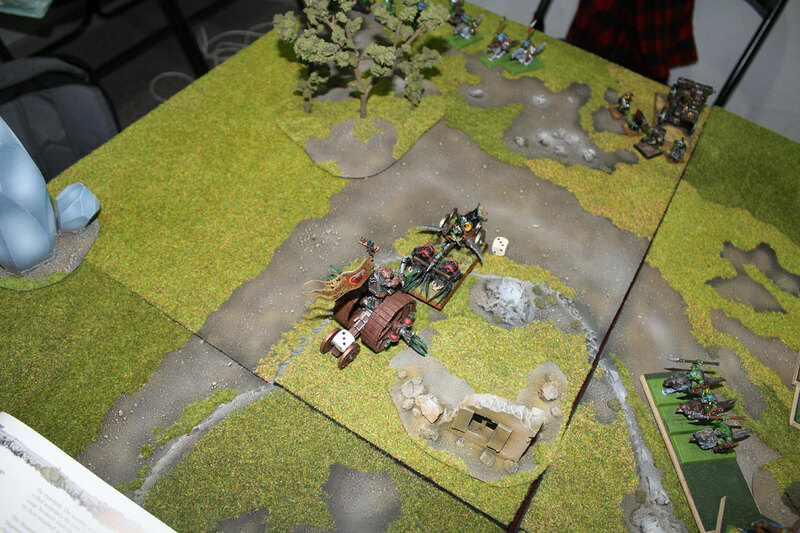 They got very close to the Skaven lines. Zzapvolt concentrated pure energy from Winds of Magic and converted it into electric charge. Bright Warp Lightning has emerged from his blade and struck two Big Uns’ killing them at sight! Both Doomwheels were about to show power of Clan Skryre as well. First, old Doomwheel shoot the lightnings and killed one of the Wolf Riders, and new one killed 3 Wolf Riders form the eastern unit. In the same moment, barrel in Ratling Gun began to spin faster and faster – and then the crew cried: ‘Kill-Kill!’ and shoot the series of 7 shoots at western small regiment of Wolf Riders. One was hit and killed. 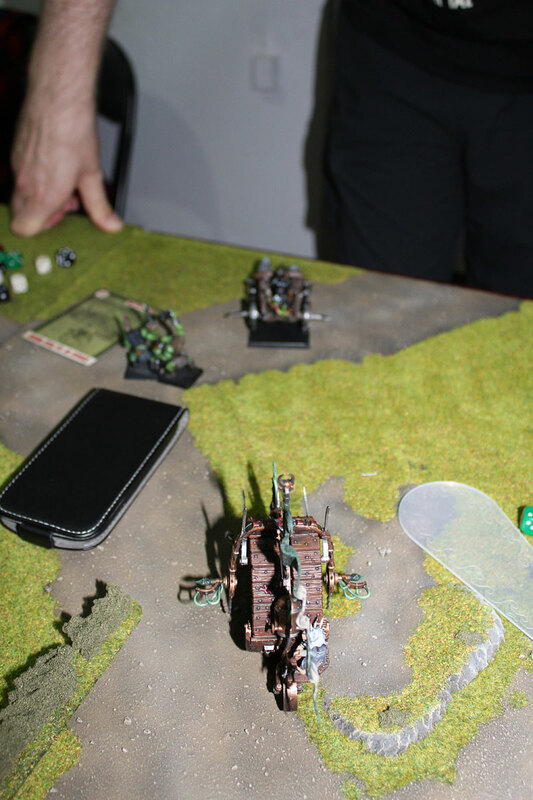 That’s was too much for these Greenskins – they panicked and ran away and even proximity of Warboss didn’t help to change their mind. There was the time for CHAAAAARGE! – Gurokk Skullstompa shouted. He wanted to protect the tower and his precious loot inside. The vermin appeared out of nowhere and now they needed to exterminated. 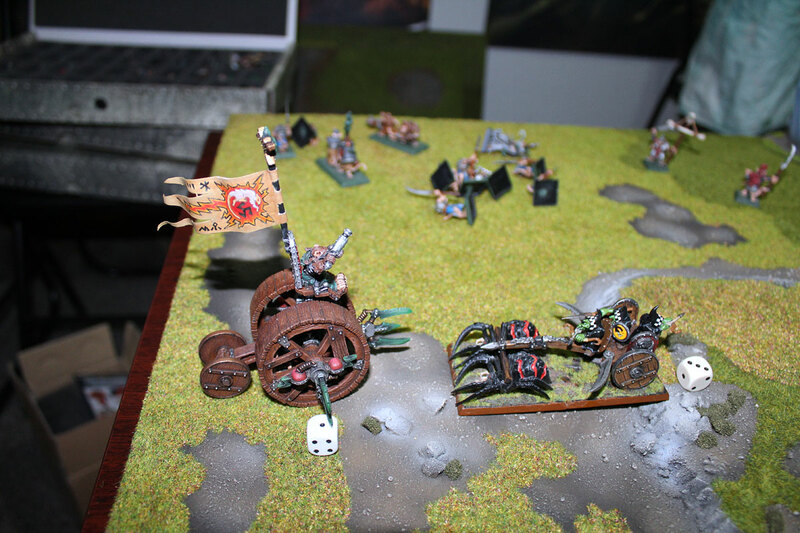 Both chariots charged Doomwheels, but in the middle of the battle – trolls hesitated a little seeing Warpfire Thrower in the front of Skaven line, so instead of them Big Uns’ were ordered to charge the Warpfire Thrower and Clanrats. Warpfire Thrower stand and shoot, but the flame was too weak to reach running Orks. There must have been scared of green fire burning upon the wind, because they slowed down right before the Warpfire Thrower and they failed to charge. 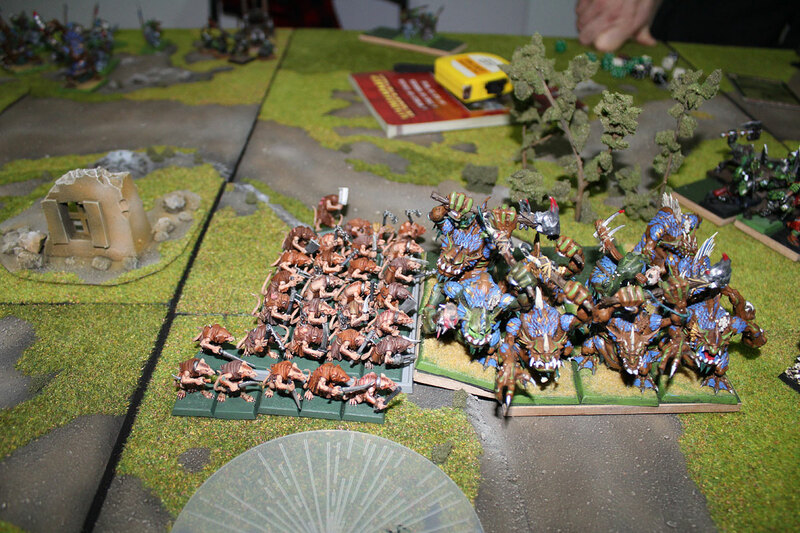 Meanwhile panicked Wolf Riders rallied and Trolls advanced trough the forest to face the unit of Stormvermin. 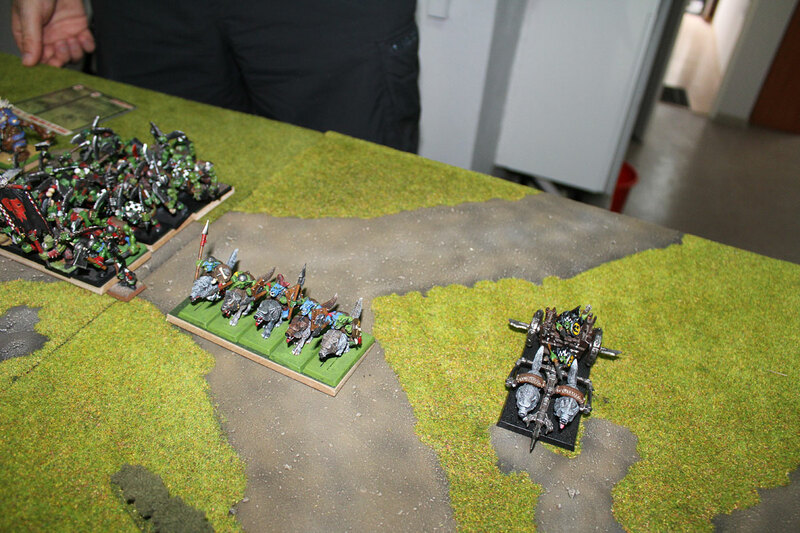 Second, eastern unit of Goblin Wolf Riders ran around the watchtower and flanked the Clanrats. Goblin Shaman casted two spells: first was Gork’ll Fix It on Stormvermin. The second one were Curse of Da Bad Moon causing magical vortex travelling trough the middle of Clanrats. Lucky for Skaven the not many of them were sucked in into the warp – only 4 Clanrats and Warpfire Thrower died. Rock Lobber thrown big large rock on the back of Stormvermin unit. The accuracy of Goblin crew was not perfect, so the rock scattered and killed only one Stormvermin, but managed to hit Ratling Gun. The gun crew was smashed and what’s was left was the wet bloody puddle. Ratling Guns smashed by big rock. Eastern flank: the same here:). 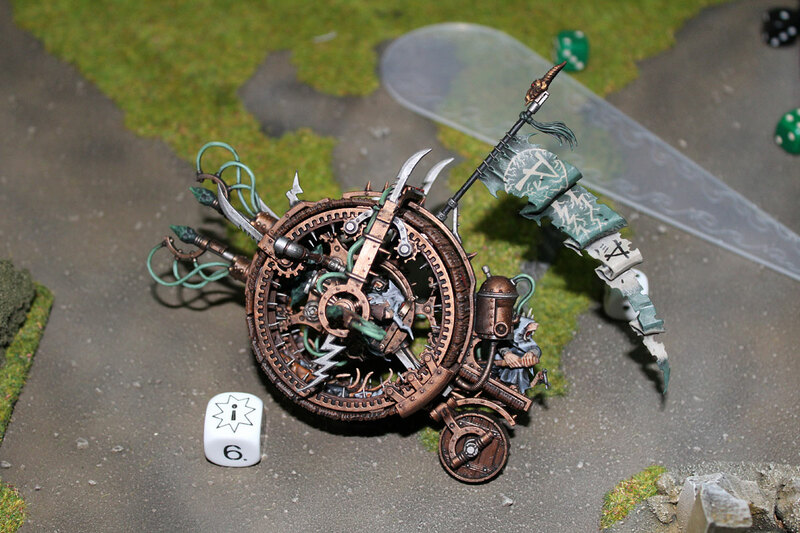 Old Doomwheel rallied and soon it will release another portion of Clan Skryre famous electric power! Winds of Magic were not generous – they provide not too much power- it was sufficient enough to cast Bless with Filth (making Stormvermin halberds poisonous) and to try to cast Skitterleap. Gobin Shaman dispelled this one. Too bad for the Skaven army and Quiksqueek. Skitterleap was meant to teleport him to better ans more secure location. Anything would be better than those hideous Trolls ahead. Doomwheels’ lightnings were cumulating, but suddenly in both power generators something unexpected and wrong happened! Both malfunctioned!. In first – old Mark 5 model – all the electric charged were directed into the wheel’s warp generators. The mechanism was powered with true burst of speed! 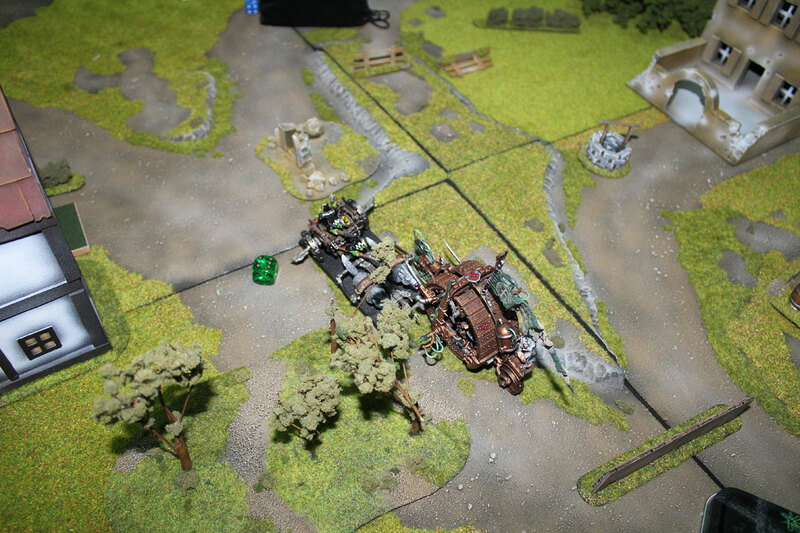 In second Doomwheel also went something bad with the charge, but in its case – it caused some damage to the machine but thankfully nothing disastrous. 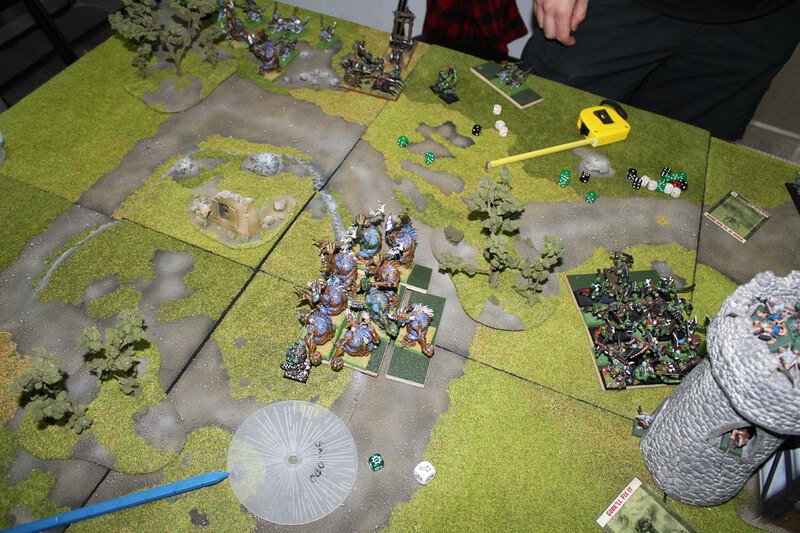 The most important events were about to occur in the middle of the battle, where brave Stormvermin attacked Trolls. Quiksqueek was about face Warboss Gurokk Skullstompa. One of Stormvermin dropped his clothes and armour and took out hiss hidden green glowing blade. Assassin comes out of the shadows! Rest of Stormvermin managed to kill only one Troll. 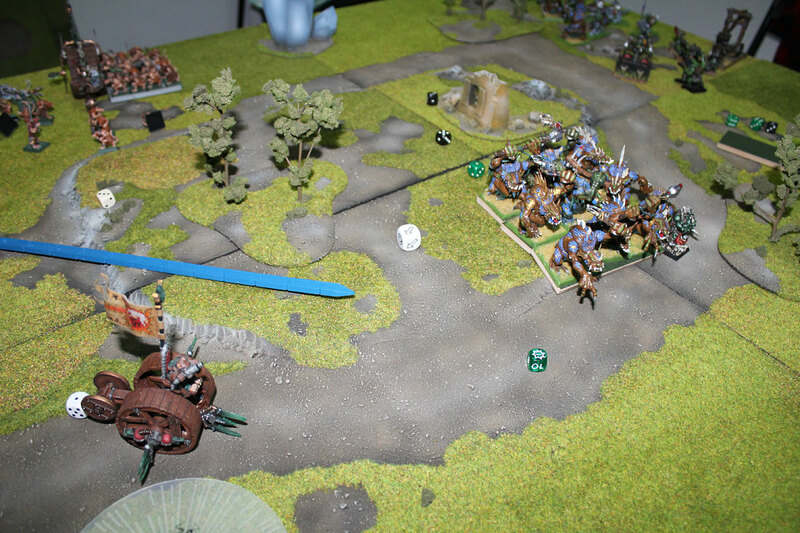 In return Trolls killed Raddrish The Last (Battle Standard Bearer), over confident Shide The Silent and one Stormvermin. 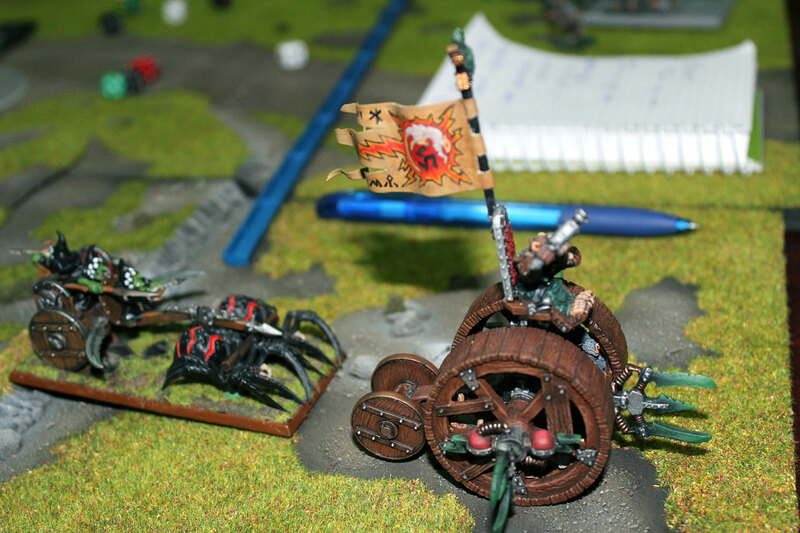 In spite all the losses, Skaven won the combat (thank to the banner and the slowly rhythmical drum of regiment’s musician). Golden Crown of Command on Gurokk’s head shined brightly – this magical item were increase his willpower and all Trolls thanks to his influence became too stubborn to even think to flee the combat. The causalities: Assassin, Battle Standard Bearer and one Stormvermin. Nearby Slaves forced to flee unit of Wolf Riders and instead of pursuing them, they turn into direction of Trolls. Gurokk Skullstompa was furious! Rats in front, rats in the flank and rats in his tower! That was enough! All of this is ending right now! 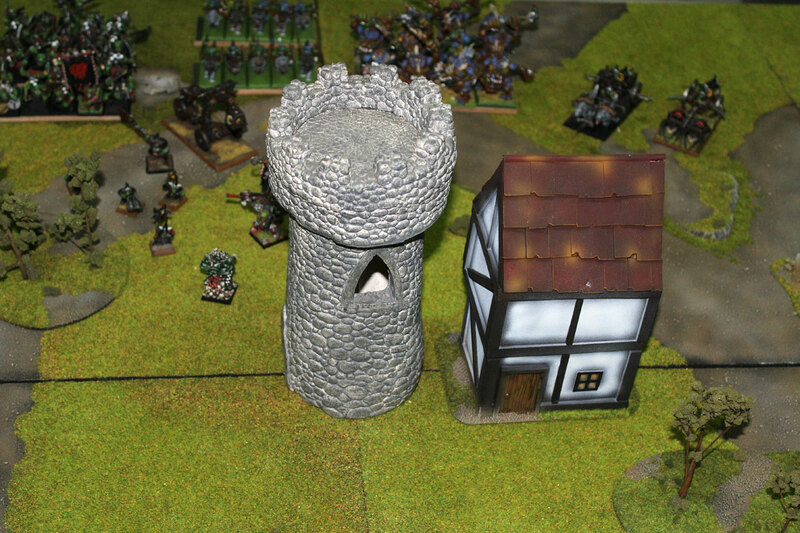 Big Uns’ Orcs charged into the tower. The entrances to the tower allowed only to ten Orcs fight against ten Clanrats. Big Uns’ charged the tower. Chariot on the eastern side fled the battle, and one on the western side charged the Doomwheel again. Goblin Shaman repeated his magic tricks – first he casted Girk’ll Fix It on Clanrats and released The Curse of Da Bad Moon again. Both spells were failed to dispel by Lord Quiksqueek. It was not only Curse of the Bad Moon but also feel like Horned Rat abandoned Quiksqueek! Magical vortex passed trough the tower over the Stormvermin. 7 of these elite warriors were sucked in! Crse of Da Bad moon strikes again! Rock Lobber misfired and the throwing mechanism jammed for some time. At least here the threat was stopped for now. The east side: old mark 5. 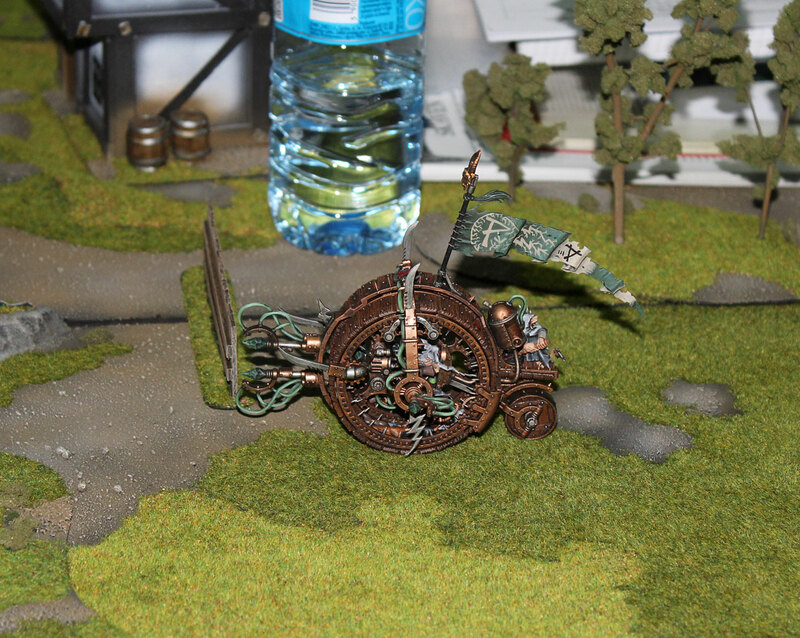 Doomwheel was charged by chariot and he lost the combat, but again (!) he fled them and stopped near to the edge of the battlefield. Big Uns’ were storming the tower. They killed 8 of defenders and Clanrats killed back only two of big Orcs. 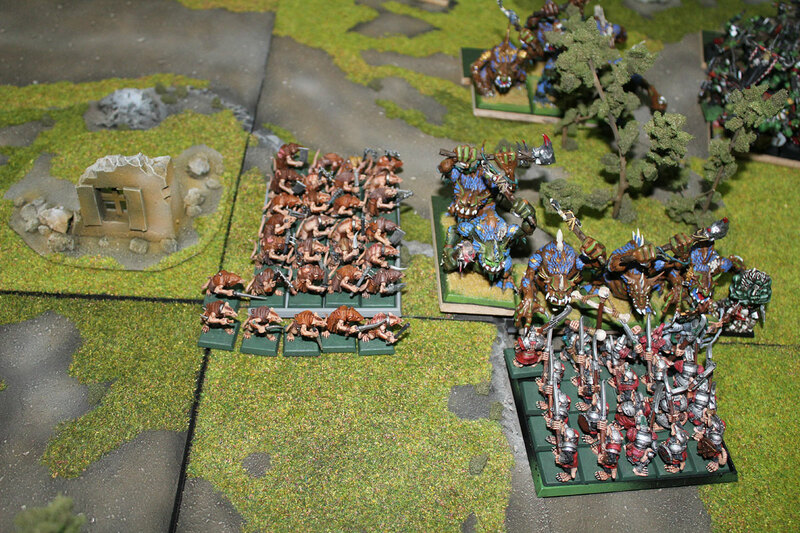 Skaven comparing to Orcs are small and weak, so this fight was very uneven. 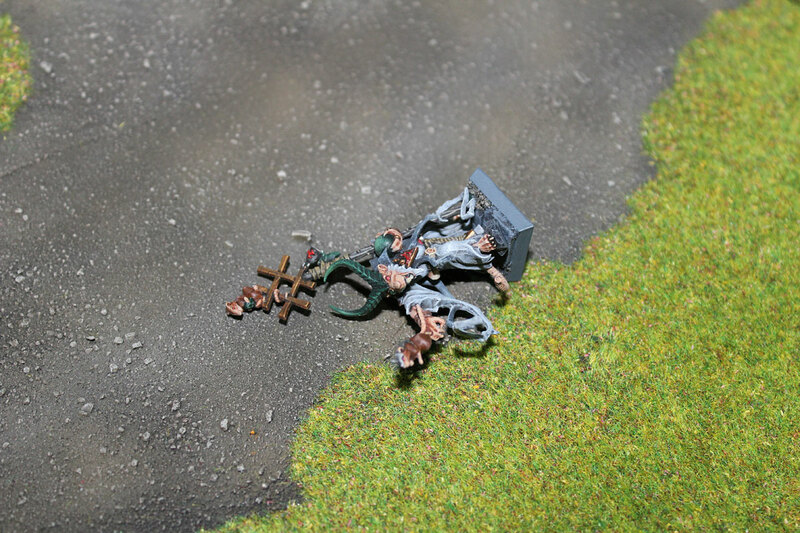 But Zzapvolt hidden in the remaining Skaven warriors shouted: Rats! Steadfast! and surprisingly Clanrats listen and stand firm. Orcs were pushed back. Hurray! But the most important part of the battle was here. Trolls against Stormvermin. Because of Curse of Da Bad Moon the regiment of Stormvermin were partially wiped out. There was very little chance they will stand against Trolls for a long time. 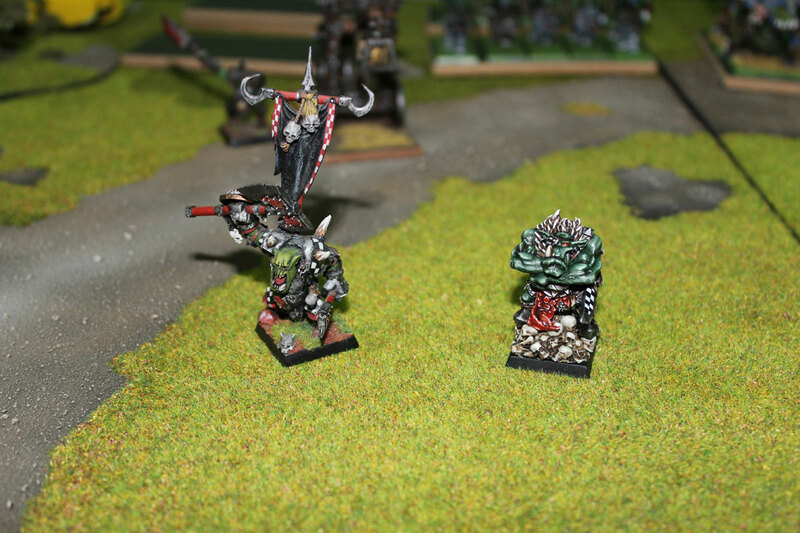 Gurokk Skullstompa called for challenge – and brave Fangleader stepped forward. The fight was fierce – and Fangleader survived, protected by the Horned Rat himself. 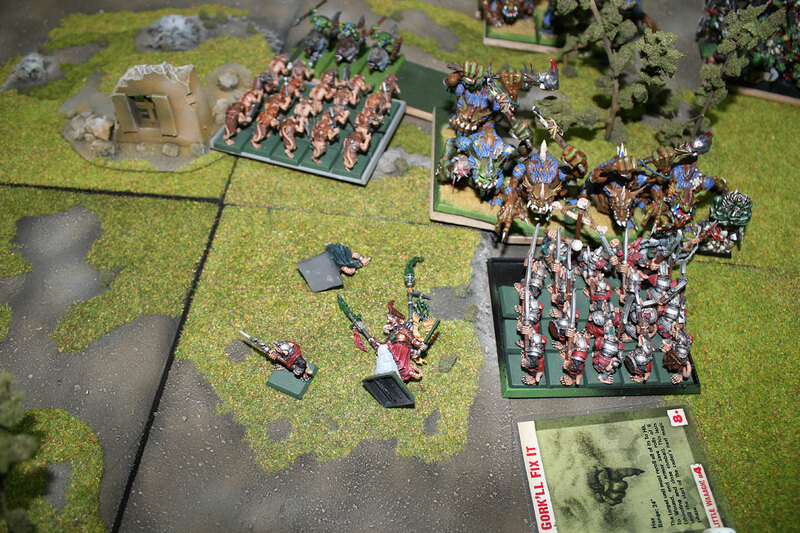 Skaven God saved him from certain dead (Orc Warboss hit twice and rolled two 1s to wound!). But the grim laugh of Vermin Lord echoed over the battlefield. The Fangleader was saved, but not for long. Trolls killed 3 Stormvermin and that was enough to force all regiment to flee! Trolls with ease caught them. All was lost! Quiksqueek barely escaped death but it was nothing left! East: Doomwheel is wheeling to the middle, and on the west, old Doomwheel rallied. 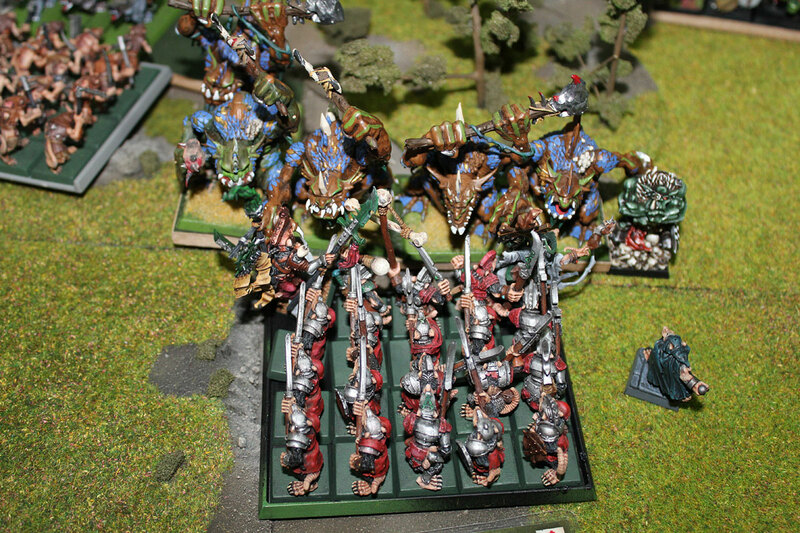 Skaven Slaves charging Trolls… wise or stupid…? 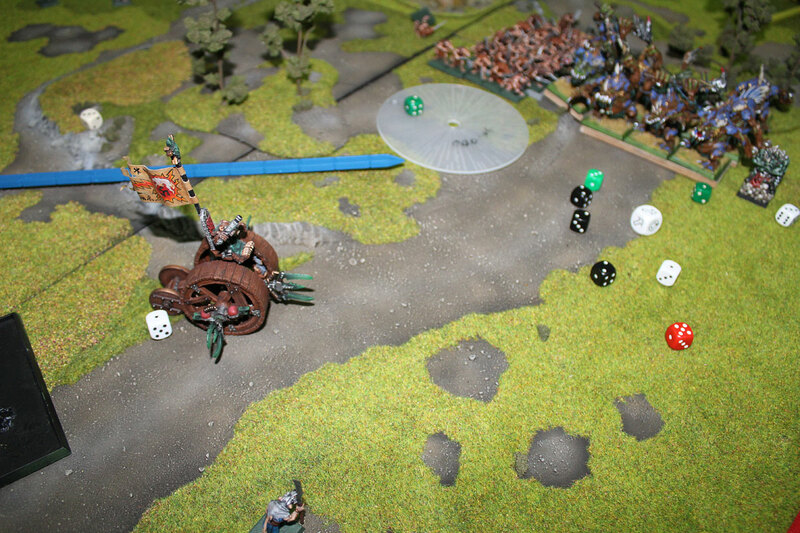 Rallied Old Doomwheel released two lightnings and destroyed pursuing Spider Chariot, and during release of the third charge – something went wrong and Warlock Engineer lost control of the steer. Zzap! The chariot is gone! Doomwheel turned into the middle, near to the trolls. … and it’s out of control! New Doomwheel, on the east, also malfunctioned, but this time all the electric power overcharged the generator and destroyed the machine. 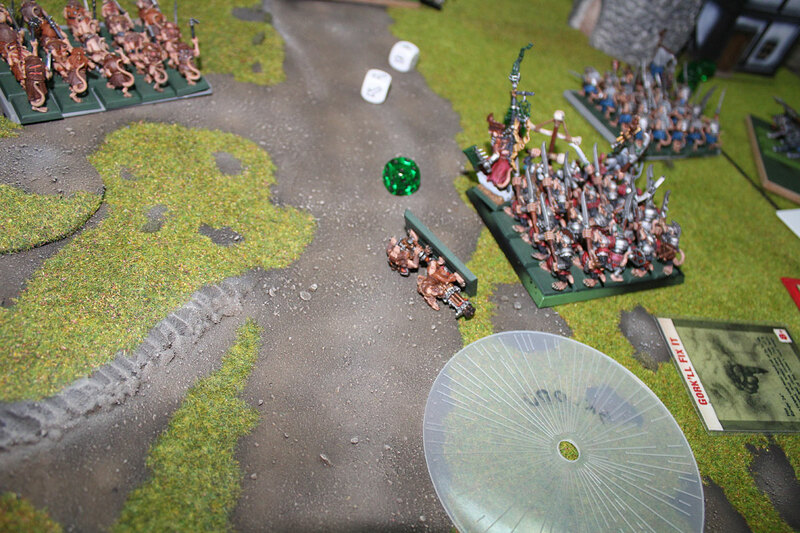 Trolls chased and caught Skaven Slaves. …and the rats in the tower were preparing for another attack of the Big Uns’. And the attack took place soon enough! Orcs charged the tower one more time! At the same time Trolls faced direction to the tower. 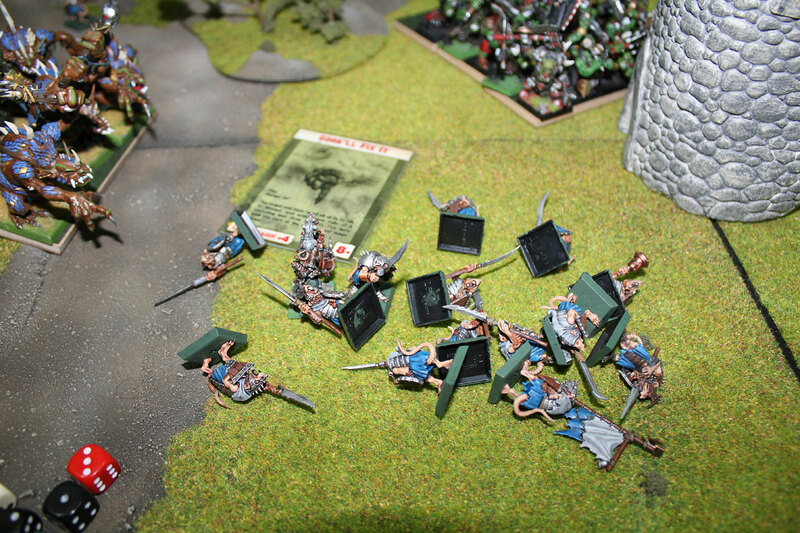 The combat was one sided – 7 Clanrats died. And only few were to scared to protect the loot inside. Even Zzapvolt decided it’s better to retreat… The battle for watchtower was lost. well, I realize my army is not specially competitive. Way too small regiments of Slaves and Clanrats to even stand and fight against Trolls or Orcs (tough bastards! ), but still I have so much fun, despite the defeat. Assassins could make lots of damage. My rolls were not good though, and this Troll regeneration is annoying. I will give Shide The Silent more chances though. My rolls were statistical all right during whole battle, but I had no luck in two very important moments: dispelling (twice!) Curse of Da Bad Moon which killed 10 Stormvermin and Ratling Gun! Damn! I don’t have so much luck with magic in my last four battles. It has to change – spells supposed to be my greatest advantage. I should operate Doomwheels more efficiently. In this battle they have been stuck with those annoying chariots. Next time – I need better planning for them. I would love to change my army list, but still I don’t have enough painted miniatures to make any significant change – slowly I’d be able to rebuild my army, and I’ll push the plot in different direction. For the time being, Grey Seer Quiksqueek will be raised form the dead again and his struggle to please The Council of Thirteen will go on:). Plans: I already arranged the re-match with Piotrek and his Orcs and Goblins for September, but this time his army will include more Goblins. So maybe this time I’ll manage to win the battle and deliver new slaves to the mines? Hopefully:). And meantime on my workbench: Blood Angels Terminators, Infinity Reverend Custodier and Screaming Bell. And beside that I’ve started to arrange my collection in order to choose some part of it to take to my next big trip (Australia, New Zealand and Asia) – and with this – there’s plenty of work…ufff..